This engaging memoir tells the story of a man’s attempt to reconcile his sexuality with his religion. 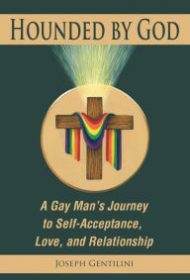 Through excerpts from an unpublished autobiography and journal entries, the author, a gay man and devout Catholic, reveals the often-painful struggle he faced to integrate these disparate parts of himself. Gentilini discusses how his mother “believed that I had lost my faith and was living an immoral life” when she learned he was gay. He later realizes that she loved him “the very best that [she] could.” He also writes candidly about his fear of intimacy. When he’s single, “I’m frustrated because … I don’t have a lover. And yet when the concept of an intimate relationship even appears on the horizon…, I run away.” Even after marrying his partner Leo, he fears the relationship will end. Thankfully, Leo is a stable, patient man who helps show Joseph how to give and receive love. Religion permeates this book. Joseph describes his yearning for “union with God and with men,” even as the Catholic Church forbids him from participating. He joins a group for LGBT Catholics and writes letters to Church officials urging them to abolish their anti-gay doctrines. Many entries include prayers asking God for self-understanding. Readers will appreciate Gentilini’s complete honesty as he lays bare his own perceived failures. At times, this intense brooding feels repetitive and tiresome, but this is easy to overlook in light of the larger picture. In his Author’s Note, Gentilini mentions that his editor “made some judicious changes” to the entries “for clarification”; thus, they are more readable than most typical journal entries. One quibble: Each chapter has endnotes explaining rituals and organizations readers may be unfamiliar with. The definitions often come long after the terms’ initial use; footnotes might have been a better choice. Nonetheless, this is a moving, highly readable account of healing and love. Anyone looking for a compelling story about self-acceptance will find it a powerful, affecting read.